For a while I’ve heard of this mythical flash streaming that is now supposedly built into MythWeb. However I have yet to see it anywhere in the website. What gives? So I decided to get to the bottom of this. 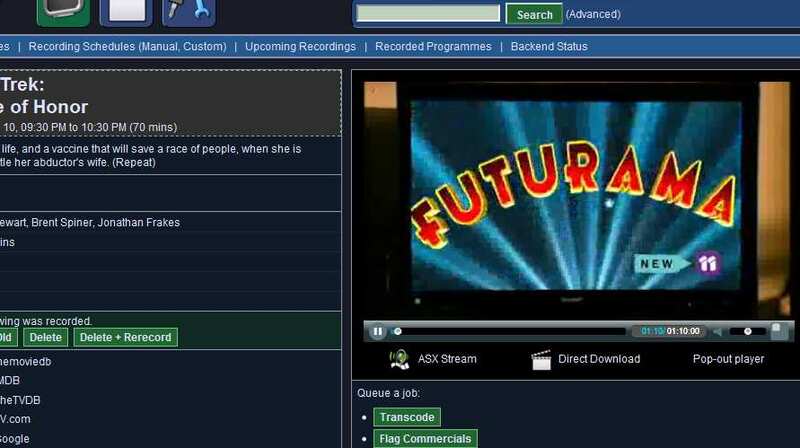 There’s a wiki article on MythTV web which describe how it’s done, but it’s said to be outdated and pointed to MythWeb’s wiki page, which only mentions it’s been rewritten to enable Flash streaming. So how do I enable it? After digging in source and finding various shenanigans with the WebFLV_on variable, the answer revealed itself in the preference pages of MythWeb (Settings > MythWeb > Video Playback). There is a tick box to “Enable Video playback”. However, it says it requires ffmpeg with mp3 support. I’m using gentoo so installing ffmpeg was just a matter of emerge -av ffmpeg. After installing, I can finally tick the “Enable Video Playback”. However arriving at the preference pages and tried playing on the flash player, a new stumbling block appeared. It says that the pl/stream/bla/bla.flv is not found. Navigating to it manually revealed a 500 Internal Server Error. Since I’m using Lighttpd, I discovered that it has a deficiency logging CGI errors. The error.log was useless and I ended up running Lighttpd in non-daemon mode (/usr/sbin/lighttpd -D -f /etc/lighttpd/lighttpd.conf) and looked at the errors spat out on to the console. Turns out that it requires Math::Round which I haven’t installed. It’s by no means perfect with video being low quality, lack of seeking and some high CPU usage – but it works! This entry was posted in Uncategorized and tagged flash, mythtv, mythweb on February 13, 2011 by Loune.